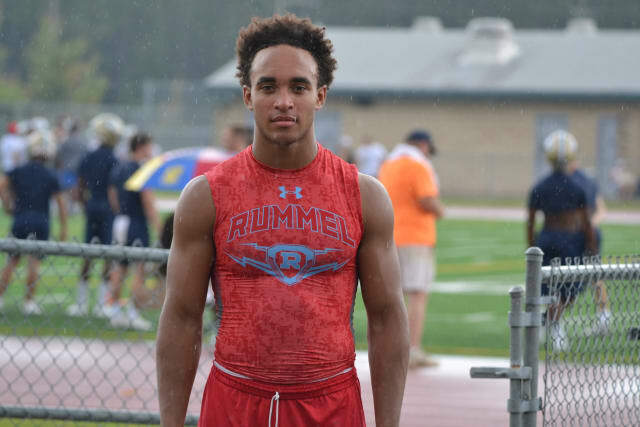 Georgia adds three-star safety prospect Aaron Brule to its 2018 recruiting class. Aaron Brule. Image via SEC Country. Georgia has its 15th commitment to its 2018 recruiting class. Metairie, Louisiana high school senior prospect Aaron Brule committed to the Bulldogs on Sunday via Twitter. There are only four Mountain West schools with a winning record following Week 3 of the college football season. Expect that number to rise as conference play begins. Oklahoma, Oklahoma St., TCU three games away bowl eligibility. This first Big 12 Bowl Eligibility Watch is focusing on the teams with two and three wins following Week 3. Seven out of the conference's ten teams fit those qualifications. If you're Kansas, Texas. or Baylor. you might want to start to worry. Well, maybe not Texas. Bowl Eligibility Watch 2017 - American Athletic Conference post Week 3. South Florida is the current favorite among American Athletic Conference teams to make it to a New Year's Six bowl came. It's the only 3-0 team in the conference, with three 2-0 teams, and three 2-1 teams. Five Big Ten teams halfway from becoming bowl eligible. The 2018 Rose Bowl is hosting the College Football Playoff semifinal pitting the no. 2 and no. 4 teams in the final CFP Selection Committees' rankings of the 2017 season. It could very well mark only the fifth time since 2002 that a B1G team would not represent the conference in Pasadena. Hurricane Irma caused a number of ACC teams postponing or canceling games over the past two weeks. Miami@Florida State was postponed from last weekend, and both schools canceled non-conference games in Week 2. A Georgia Tech road game against Central Florida was also canceled. 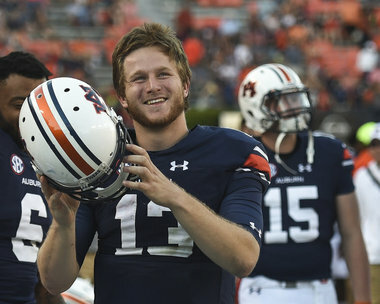 Auburn backup QB Sean White dismissed following public intoxication arrest. Sean White. Image via al.com. Sean White is an ex-Tiger. The Auburn backup quarterback was dismissed from the team following an arrest on charges of public intoxication. Greg McElroy, Dave Pasch, and Tom Luginbill. Image via @bubbaprog. What happens when an Oklahoma State@Pittt football game goes horribly one-sided? You don mullet wigs, of course. 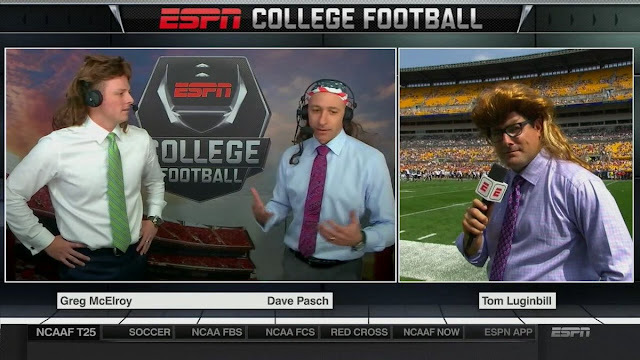 That's what happened during the 2nd quarter when the Cowboys were blanking the Panthers 35-7, and ESPN announcing crew Dave Pasch and Greg McElroy, along with sideline reporter Tom Luginbill, donned some really scraggly mullet wigs to honor the real-life mullet of Oklahoma St. head coach Mike Gundy. Week 3 begins on Thursday night, and while the season is still young there are games on the schedule where it's nigh impossible to root for either team to win. These are the Most Hateable Games of The Week. SEC Fallout: Bret Bielema, Kevin Sumlin, Mack Womack, and more. 2017 Postseason Projections: Loss to Oklahoma damages Ohio State's chances for the College Football Playoff. Last week, the postseason bowl projectors SWRT is following said Ohio State would make it to the College Football Playoffs. One embarrassing loss to Oklahoma later, and the college football postseason landscape looks a whole lot different. Georgia places kicker Rodrigo Blankenship on scholarship. Rodrigo Blankenship. Image via DawgNation. 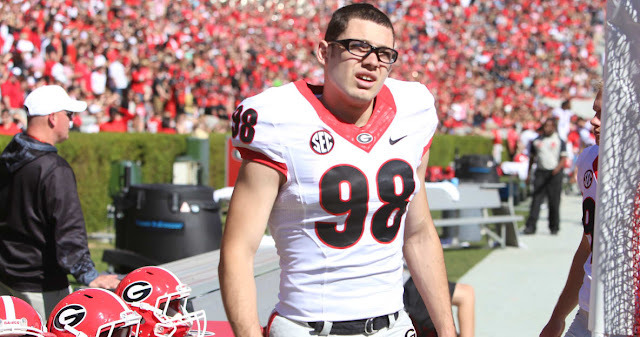 Rodrigo Blankenship is an ex-Georgia walk-on. The bespectacled kicker has officially been placed on scholarship by Georgia head coach Kirby Smart. 2017 Postseason Projections: Is Oklahoma State fated to go to the 2017 Cotton Bowl? Oklahoma State is getting prepared to face South Alabama on the road in Mobile, Al. on Friday night. Meanwhile, the overwhelming majority of the 2017 postseason bowl projections SWRT is following have the Cowboys heading to the 2017 Cotton Bowl in December. 2017 Postseason Projections: Will Clemson return to the CFP Semifinals? Clemson shocked many in the college football universe by defeating Alabama in the 2017 College Football Playoff title game last January. The majority of notable pundits see the Tigers back in the CFP again this season, though somewhat divided as to whether the team goes to the 2018 Sugar Bowl, or the 2018 Rose Bowl. 2017 Postseason Projections: Will Alabama be headed to the 2018 CFP/Sugar Bowl? The pundits have released their college football postseason projections following Week 1's games. Naturally, most of them have Alabama in the College Football Playoff yet again. The majority of pundits have 'Bama heading to New Orleans for the CFP semi-final/2018 Sugar Bowl. As to whom the tide will be facing, however, the pundits are less united. The most hatable games of Week 2 of the 2017 college football season. Week 1 of the college football season is mostly Power 5 teams demolishing smaller Group of 5 or lower teams. Things start to heat up as some schools face a tougher opponent from either another P5 conference or a in-conference opponent. It will still result in games where viewers would really rather watch US Open tennis or worse...baseball. Here are the five most hatable games of Week 2. The fact that an in-state rivalry game such as Iowa-Iowa State is played traditionally played in Week 2 of the college football season should be enough evidence that everything about this rivalry is wrong. The game is so traditionally bad Spencer Hall and Ryan Nanni gave it the dubious name "El Assico" a couple of years back. That is a fitting title for a rivalry upper-to-mid level Big Ten team versus a traditionally bottom-level Big 12 team. In-state rivalries have a knack for being ugly, but "El Assico" takes this to a level of being notoriously unwatchable. Despite the Iowa leading the series 42-22, and trouncing Iowa St. last season, don't expect this game to be easy for the Hawkeyes to win, or even come out of it with a shred of dignity. BYU's football and basketball programs has garnered a reputation as being "dirty teams" in recent years. The basketball rivalry with Utah has gotten so bad that former Utah basketball coach Larry Krystowaik cancelled the 2016 iteration of the on-the-court rivalry on the grounds of "safety concerns." The current agreement between the two schools to face each other in football runs out in 2022. The complexities of Power 5 school scheduling could cause the series back into hibernation. Dirty play on the gridiron could cause deal to end sooner than expected. The last (and only) time Georgia faced Notre Dame is when the Bulldogs beat the Fighting Irish in the 1981 Sugar Bowl. It's tempting to say 1981 was the last time both teams were relevant at the same time, but to be honest, it would be more like sometime during the Clinton administration at the latest. The old guard will get into this game, but virtually no other CFB fans will. The only time Oregon has beaten Nebraska in the seven game the two teams has faced each other was in 1953. Oregon is trying to rebuild following a disappointing 2016 season, while Nebraska still hasn't accepted the possibility that it will remain a 9-4 at best for the near future. Lane Kiffin's first game as head coach of Florida Atlantic ended with the Owls getting keelhauled by Navy. Will facing Wisconsin this week result in a different outcome? Watchable only if you really want to see Lane Kiffin have his lunch handed back to him. Big 12 Fallout: Baker Mayfield, Tom Herman, Anu Solomon, and more. Texas first-year head coach Tom Herman finds himself at no. 6 in the latest Coaches' Hot Seat rankings following the Longhorns' Week 1 loss to Maryland. Kansas head coach David Beaty is ranked no. 17 on the list, followed by Texas Tech's Kliff Kingsbury to finish out the site's uh, "Top 20." One Hit To The Body. SEC Fallout: Kevin Sumlin, Will Muschamp, Jake Fromm, and more. Your questions have become tiresome!